U’Chique Body Sculpting treatment at Romney Park Spa / Gee Whiskers! A few weeks ago I was invited to try out the U’Chique Body Sculpting treatment at Romney Park Spa in Green Point, Cape Town. With summer approaching and being a little too lazy to exercise after a long day at work, I jumped at the opportunity to try out the Accent Ultra machine. The machine is the only device that combines controlled Ultrasound and radio frequency modules to effectively target localised fat deposits and signs of ageing. 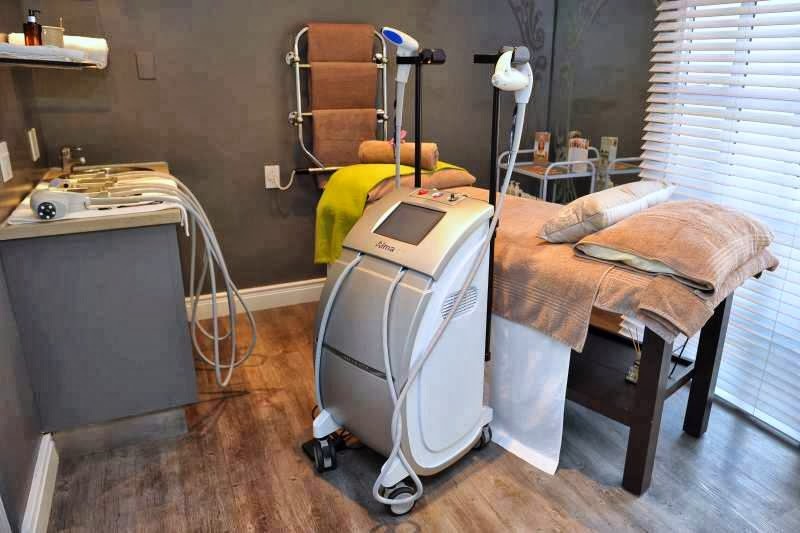 The Accent System uses two types of radio frequencies (unipolar and bipolar) to penetrate deeper into the skin and maximise the benefits of the treatment. You truly get dramatic changes with fewer treatments than other machines on the market. I was welcomed to the Spa by Eunice Grobler who is highly trained in operating the machine and personally uses it on herself. She took me through the technology of the machines, carefully explaining the whole process to me before showing me a portfolio of clients. What immediately grabbed my attention was that the before and after photos averaged around 2 treatments. With other before and after photos I usually see “After 10 treatments” in fine print which is where I usually walk away from even going for a treatment. One cannot devote so much time and money to see only a slight change. I was truly lost for words while paging through the booklet – it seems almost too good to be true. I was then taken into a beautiful treatment room where I had to choose where I wanted to have the treatment done. When Eunice told me I am too young to really have the treatment on my face I was quite chuffed so decided to have the localised fact treatment on my stomach because it was something we could complete within the session. First off some Vaseline is applied to your skin to allow the node to move across the skin easily. The ultrasound kicked off the session. It felt like tiny vibrations across my skin and was actually quite relaxing – almost like a massage. Once that was complete the Unipolar radio frequency was applied to the area and Eunice warned me that my skin will start to heat up but that I would not get burnt. It felt like I had a soothing hot water bottle resting on my stomach and it was actually quite soothing – definitely something I would love to have done in the middle of winter to warm me up. The Bipolar radio frequency penetrates the skin up to 2cm and it was actually quite surprising how you can feel the difference between the two frequencies. Again, I felt no discomfort at all with the heating up of the area – which never went over 40 degrees. During the procedure I could visibly see the difference! I am not kidding. My Mom was in the room with me and witness the whole session. I didn’t suddenly have a six pack and completely flat stomach, but my pants buttoned up a lot easier and my skin looked and felt firmer. My stomach felt warm for about 3 hours after the treatment but it was not uncomfortable at all. The next day it felt like I had been to an ab class at the gym. My muscles weren’t sore but it felt as if I had done a lot of crunches. The treatment works on firming skin by stimulating collagen production and improves the elasticity of the skin. It also lightens skin pigmentation including lightening the appearance of scars and stretch marks. It is so difficult to put the benefits into words because you do need to see it to believe it…and I believe it! You can book treatments at Romeny Park Spa by phoning 021 439 4555 or emailing wellness@romneyspark.co.za. The spa is situated on the corner of Hill Rod and Romney Road in Green Point, Cape Town. Visit the U'Chique blog to find out more about the treatments and view the results people have achieved. I did these types of sessions before I got married and it totally worked for me! I know! I think all women will jump at this opportunity! Effective treatment for everyone who suffered problems like overweight and other body related issues.